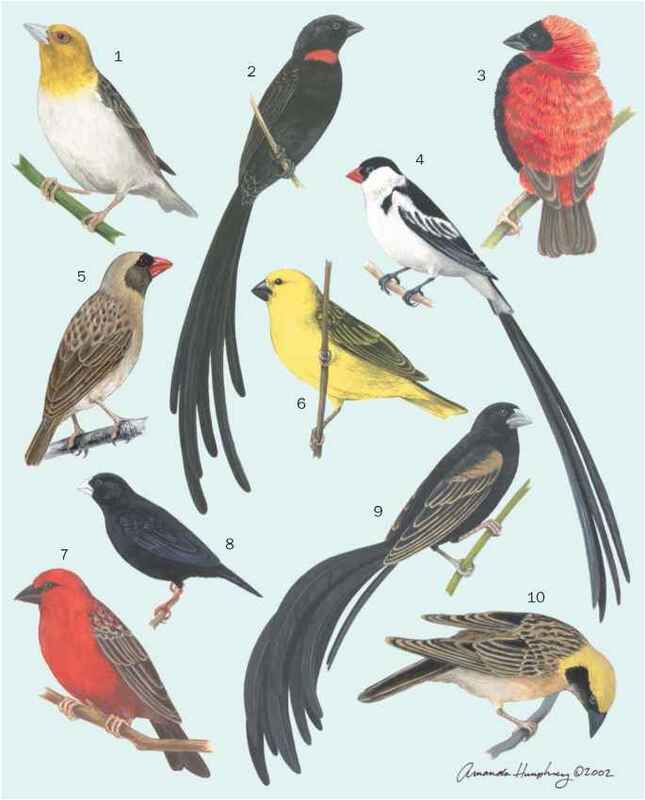 English: Pink-backed firefinch; French: Amarante de Jameson; German: Rosenamarant; Spanish: Pinzon Candela de Jameson. 3.9-4.3 in (10-11 cm). Sexually dimorphic; males bright red on head, breast, and underparts; females light brown except for bright red lores. Juveniles similar to females but lack red lores. Central Ethiopia south to Mozambique, Zimbabwe, and Zambia. 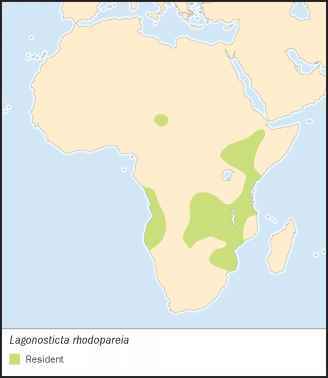 Discontinuous populations in western Angola and in southwestern Chad. Occurs in areas containing both low cover and ample grass including grassland, thicket, forest edges, bracken-briar, and thorn scrub. Found in pairs or small groups. The call is a "ti-ti-ti-ti-ti" or a softer "tsit, tsit." The song is a melodious "we-we-we-we-we" or "weet-weet-weet-weet" with a whistling "feeeee" repeated several times. Feeds on or near the ground on seeds of grasses and other plants, and occasionally on small invertebrates. The breeding period is at the end of the rainy season and the beginning of the dry season. The round nest is built by the male in small shrubs and made of grasses, rootlets, and other plant fibers. This species is the breeding host of the purple in-digobird (Vidua purpurascens).